Join the discussion on our forums! Come discuss Fungalmancer over in our dedicated Fungalmancer discussion topic. How long can this go on? As long as there are mushrooms for all! Do you have any screenshot? This is a bug for sure should not work like this. Two copies of this little fella helped bring me to 12 wins in arena. Makes trading much more efficient, and also helps push for lethal with a 4 damage charge if you can set up the board. Seriously underrated, at least in arena! Could it be, another sleeper card, 2 months into the expansion? If so, just goes to show how bad people are at evaluating cards, and how nerfs can allow other cards to shine. "This card is an easy 1-star. It's terrible." I'm just gonna stop watching card evaluations before and right when future expansions come out because everyone underestimates every single card. This card is crazy, I'm surprised we all slept on it. More so the latter than the former. No one really cared about this card when it was shown or released but after the nerfs it actually became quite popular and good in certain decks, like zoolock or secret mage. Is this card better than Sunborne Val'kyr? or do the stats make it worse? I would say it is generally better than Val'kyr, but they also sort of do different things. 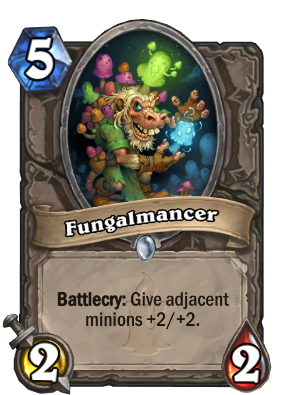 Fungalmancer is better for aggressive strategies since it gives you up to 4 points of attack that can be used that same turn, but Val'kyr is good if you just need health and don't care much about the burst damage (like if you are using a lot of taunts or a deck that like health buffs and big minions like Priest). Val'kyr's better body means that it is less dependent on your board state and it's less of a waste of you only have one other minion to buff whereas Fungalmancer is useless if you don't have the minions to buff. One big factor for me at least though, is that I would probably only ever use Val'kyr in a Priest deck, but in a Priest deck, I like Temple Enforcer more as a health-buff minion and there are already so many health buff spells that Val'kyr doesn't make the cut. Same stats as Doppelgangster, but different synergy. I don't know, we'll see. I don't see a single "Defender of Fungus" in this chat. It's Defender of Fungi bro. Could be the sleeper card of the set.